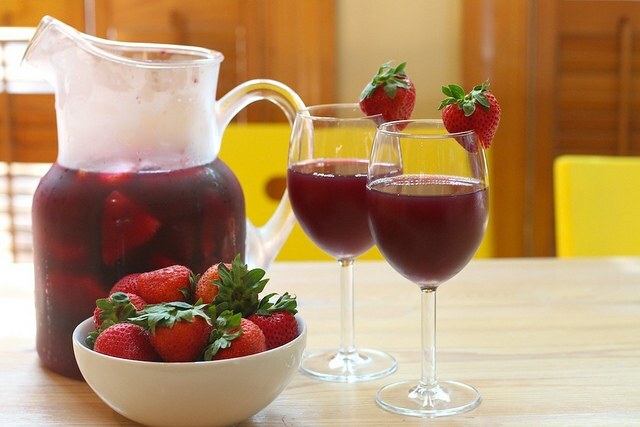 Strawberry liqueur – a wonderful drink, which you can do at home. It turns out she is stronger and sweeter liqueur vodka. Is perfect not only for drinking but also for flavoring various baked goods. - strawberry – 2.2 kg. The number of ingredients listed is based on 3-liter jar. If you take a bottle of larger size, then the products should be taken more. To prepare a homemade infusion of strawberries follows: berries to sort, wash, place in a colander parties in order to glass water. Next, they should pour to spread out a towel and leave for some time for drying. Then the strawberries carefully cleaned from sepals to shift into the prepared jar and cover with sugar. A jar thus prepared berries should be covered with a clean gauze and clean before the process of fermentation in a warm place. Then it is necessary to install the water stopper and leave to stand in the room in the shadows. To ferment the wine will be somewhere around 2-3 weeks. Then, strain and pour into a clean bottle. - sugar – 0.5 kg. Washed and lightly dried berries should be pour into the bottle, pour the vodka under the neck and bring up at the sun for fermentation. A month infusion to merge, and in the Bank remaining berries, add sugar – it needs only a little to cover them. Again to make the Bank in the sun. When the sugar is completely dissolved, you will need to drain the juice to an existing infusion. So it is recommended to repeat several times until the berries will not "obestochennye". Infusion is ready. By the way, as a result of such actions it is possible to not only brandy but also sweet alcoholic liqueur, and berry juice (if the berries are dried, cover with water and leave like this for 2 weeks). vodka and 500 ml (or the same amount of very good alcohol). Ripe berries should be reworked to fill in the bottle with a wide neck, sprinkling each new layer with sugar. Then, the bottle should tie parchment paper and put in the sun to strawberries, let the juice. When this happens, the berries need to add vodka and citric acid. While the resulting liquid should completely cover the strawberries. Capacity is removed for a month in a cool place, then pour into bottles. Feeding brandy to a festive table it will be possible in 3-4 months. Now you know how to make a strawberry liqueur – delicious, rich, flavorful. Cook with pleasure!